After a nice, meditative break, Nine Caroline is back and even more fabulous than before, and with a few updates: We've opened up an Etsy shop! And we'll be managing some of our jewelry and decorative antique sales via our online shop. Moving our inventory around has allowed us to rediscover some pieces that represent a glamorous touchstone in the history of art and design. 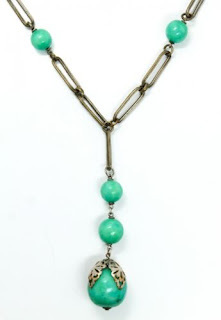 A few of the pieces we've moved to our Etsy shop are wonderful examples of Art Deco jewelry. A lot of the items we receive can be classified as a part of the Art Deco movement --A movement concentrated heavily in the use of elegant and non-traditional shapes, lines and designs. Art Deco, or Syle Moderne originated as an architecture and decorative arts movement in the 1920s as a response to, and evolution of the Art Nouveau, Cubism, and The Bauhaus movements. Art Deco artists also pulled influence from Egyptian and American Indian designs, as well as elements from nature. Art Deco style reflects chic modernity, technology, and a futuristic aesthetic. While the Art Deco movement began in the 1920s in terms of art and architecture, Art Deco Jewelry become popular in the 1930s. The Art Deco design represented modernist art turned into fashion intended to pull away from traditional forms in a sleeker and more elegant manner than previous styles. Our assortment of Art Deco rings, necklaces, and brooches are characterized by beautiful color combinations, smooth lines, and geometric shapes and designs both simple and elaborate. Initially, Art Deco was a luxury style, employing sleek and iridescent materials like crystal, pearl, silver, turquoise and jade. Jewelry from the Art Deco movement was designed primarily to make a statement in an elegant, less floral, adorned and detailed fashion than its Art Nouveau and Victorian Predecessors. The Art Deco style is not limited to vintage jewelry, interior design and architecture. Many contemporary artists are classified as Art Deco representatives. We recently came into a collection of modernist brooches hand designed by artist Nelly Natzler, sister of famed modernist ceramicist Otto Natzler. 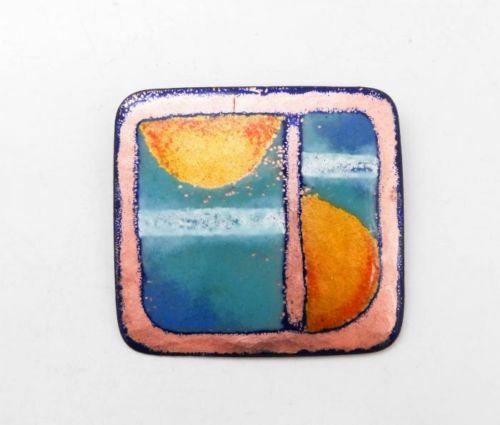 Our collection of brooches is punctuated perfectly by our assortment of Natzler originals. These brooches are charmingly characterized by bold and pastel hues, combined with sleek lines and unconventional shapes to create one-of-a-kind pieces that remain timelessly fashionable. Natzler was an Austrian born artist and the older sister of Otto Natzler. Nelly and Otto, both born in Vienna, were interested in the arts and studied various mediums. Otto studied violin and then textile design until meeting his second wife, Gertrud, who introduced him to ceramics. Otto and Gertrud would go on to fantastic success with their partnership in the United States. Nelly, a lesser known Natzler, but nonetheless an artist in her own right, won a $5,000 prize in a Paris art show in 1938. She astutely used her winnings to help her family flee from the then German invaded Austria to the United states. This jewelry came to us from an elderly couple in Upstate New York. This couple knew Otto & Gertrud's sister-in-law, Cora Natzler. Cora was in possession of this brooch and kindly gifted it to the couple. 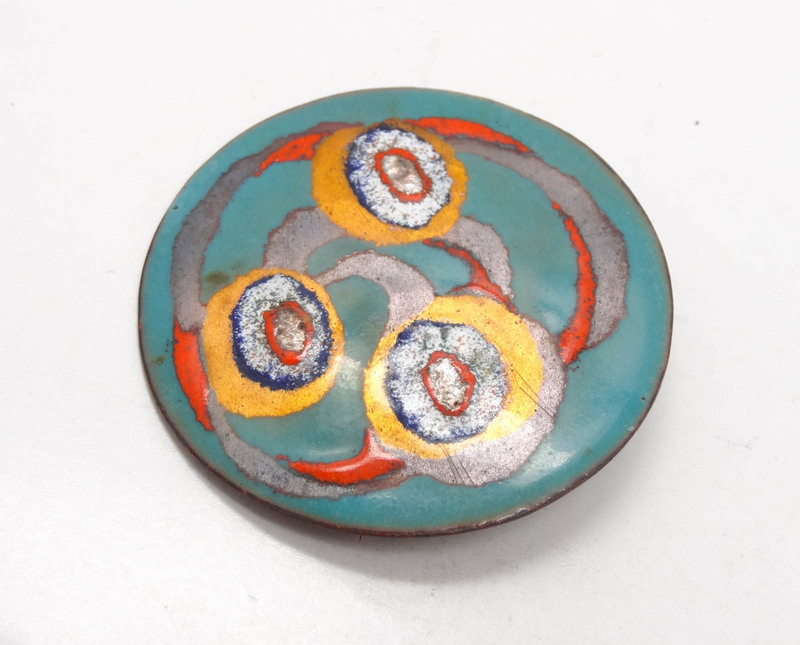 This wonderful enamel on copper brooch painting depicts an abstract, geometric design in fine blue, green, pink, and yellow colors. It is singed with her initials "NN." Art Deco and modernist styles like these have made thier way back into the main focus of popular culture in movies such as the 2013 remake of The Great Gatsby with Leonardo DiCaprio, and in wedding fashion with the growing popularity of Art Deco gowns. Art Deco will always be a staple of modernity, even more than 90 years after the movement began. Stay chic with 9CA and visit our Etsy shop to view our collection of Art Deco and modernist jewelry. We've got vintage pieces and other unique treasures like these to grace our inventory, and we'd love to share them with you. There are some more stores in ETSY like Segal Jewellery which offer some nice and unique jewelry.